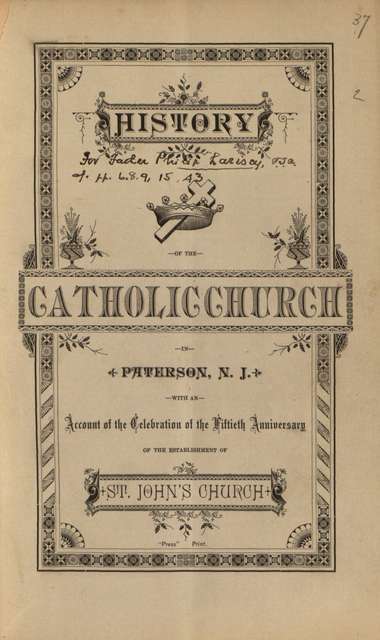 Falvey Memorial Library :: eBook Available: History of the Catholic Church in Paterson, N.J.
eBook Available: History of the Catholic Church in Paterson, N.J. When we first blogged about the Digital Library’s involvement with the Distributed Proofreaders project in March of last year, our first project was History of the Catholic Church in Paterson, N.J. A few months later, the project has been completed, and the book is now available on this page to read online or download onto the electronic reading device of your choice. 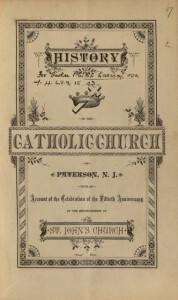 As the title implies, this is a history of a particular church in Paterson, N.J. from its construction up to the book’s publication in 1883. The church’s predecessors are also discussed, as is the early history of Catholicism in the region. The book includes brief biographies of several prominent Paterson Catholics, making it of possible interest to genealogists. More proofreading projects will be completing soon, so watch this blog for further announcements.